Interests:La lettura è il mio interesse principale, senza libri non potrei vivere. Sono un Tolkieniano Doc e su tutta la produzione letteraria del professor Tolkien ho concentrato molti anni analizzando libri saggi documenti e articoli. Ovviamente il fantasy in generale ed anche la fantascienza hanno un posto di primissimo piano tra i generi che preferisco. Apprezzo molto poi il Romanzo Storico soprattutto dedicato al periodo medioevale e alle Crociate in particolare. Amo inoltre enormemente la Storia che ha caratterizzato anche il mio percorso di studi e il periodo dell'Impero Bizantino è quello che mi affascina di più; in generale è il medioevo l'età che preferisco. Adoro la musica Celtica, Loreena Mckennitt l'autrice che m'incanta di più, e poi quella tradizionale irlandese in particolare. Infine amo il mare e la Vela. Il 6 Marzo verrà pubblicata da Mondadori l'ultima antologia edita da Gardner Dozois contenente anche un racconto di Martin The Sons of the Dragon ambientato nel periodo Targaryen del regno di Aenys I e Maegor I, IL LIBRO DELLE SPADE. Ecco il filo sottile che percorre questa ricca e variegata antologia di “Sword and Sorcery” che comprende le firme più celebri e le nuove promesse del fantasy, tutte capaci di spingere il genere ai suoi estremi confini e mescolarlo al western, alla commedia nera, all’odissea picaresca. Da Robin Hobb a Scott Lynch, da Garth Nix a Ken Liu, ci addentriamo in palazzi sfarzosi e galeoni corsari, sudice taverne e tane di draghi sputafuoco, custodi di tesori inimmaginabili. A incontrare spadaccini e guerriere, ladri e regine, cavalieri impazziti e stregoni, demoni e divinità. Una raccolta che farà la gioia di tutti gli appassionati, un omaggio a J.R.R. Tolkien e Michael Moorcock, Fritz Leiber e Stephen King, da chi, grazie a loro, ha imparato a sognare e scrivere. Sedici gemme del fantastico contemporaneo. Non credo, i tempi corrono, con Fire and Blood alle porte. 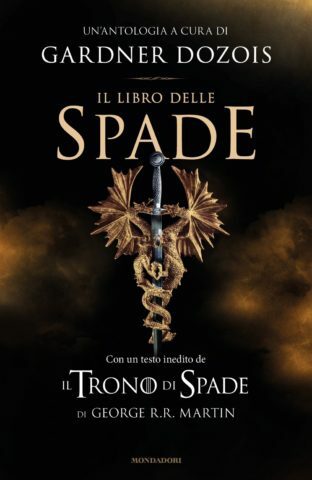 Una volta uscito quel libro tutta la fuffa GRRM e TRONO DI SPADE che si trova scritta a caratteri cubitali sulla copertina del libro delle spade perderà il suo effetto commerciale vista la minore importanza dell'opera. Invece di THE ROGUE PRINCE si sa nulla? The Rogue Prince sarà uno dei contenuti di Fire & Blood (il quale verrà probabilmente pubblicato in italiano), anche se in versione ridotta. Questo discorso dovrebbe valere per The Princessa and The Queen (orig. più corto, in F&B più lungo). Per The Rogue Prince, dovrebbe essere il contrario. "The Princess and the Queen," Archmaester Gyldayn's somewhat abbreviated account of the Dance of the Dragons, got a great response from all the folks who read it in DANGEROUS WOMEN, so we've dipped back into the archmaester's somewhat disorganized piles of scrolls and crumbling manuscripts, and brought forth another piece of his unpublished history. "The Rogue Prince, or, the King's Brother," will tell the story of the years leading up to the calamitious events of "The Princess and the Queen" during the reign of King Viserys I Targaryen, with particular attention to the role played by the king's brother, Prince Daemon, a rogue if there ever was one. I hope you'll enjoy it as much as you did "The Princess and the Queen." (And yes, sadly, "The Rogue Prince" is an abridged account as well. For the full version, you will all need to wait some years, until we publish the complete history of House Targaryen in the GRRMarillion... which, by the way, I've decided I am going to call FIRE AND BLOOD, since the GRRMarillion joke has grown somewhat stale by now). And of course it also includes "Sons of the Dragon," a chronicle of the reigns of Aegon the Conquerer's two sons, Aenys I Targaryen and Maegor the Cruel, for those who cannot get enough of my entirely fake histories of Westeros. That one has never been published before in any form, though I did read it at a couple of cons. Speaking of fake history... regulars here may recall our plan to assemble an entire book of my fake histories of the Targaryen kings, a volume we called (in jest) the GRRMarillion or (more seriously) FIRE AND BLOOD. We have so much material that it's been decided to publish the book in two volumes. The first of those will cover the history of Westeros from Aegon's Conquest up to and through the regency of the boy king Aegon III (the Dragonbane). That one is largely written, and will include (for the first time) a complete detailed history of the Targaryen civil war, the Dance of the Dragons. My stories in DANGEROUS WOMEN ("The Princess and the Queen") and ROGUES ("The Rogue Prince") were abridged versions of the same histories. "The Rogue Prince" is drawn from a text GRRM called "Heirs of the Dragon". It's about 17k words in length, and "The Rogue Prince" uses the majority of it. It does not use any part of the material for the Dance of the Dragons. "Aftermath -- The Boy King and His Regents" is almost as long as "The Dying of the Dragons", but all anyone has seen of it is the extremely compressed version (about 3,000 words or so) that we published in TWoIaF. Trovato in libreria, ma ho deciso di lasciarlo lì troppi soldi per una storiella troppo breve. Sisi sta anche in Fuoco & Sangue, e pure in una versione estesa.